Making Histories showcases writers from all over the world re-imagining the past and representing the overlooked, with work from Chris Abani, Eve Ensler, Etgar Keret, Marilynne Robinson, Salman Rushdie, Jeanette Winterson, and many more. 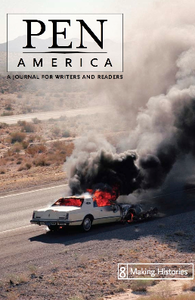 If you are interested in fulfilling international orders of PEN America: A Journal for Writers and Readers, please write to Journal[@]pen.org. Include the title(s) and your mailing address for a postage quote. Etgar Keret and George Saunders, Imagine That! Defend free expression, support persecuted writers, and promote literary culture. Get updates on events, literary awards, free expression issues, and global news. Are you an artist at risk or know someone who is? "Instead of sleepwalking us toward disaster, the US news media need to remember their Paul Revere responsibilities—to awaken, inform, and rouse the people to action." Three years ago today, Xulhaz Mannan, a prominent Bangladeshi LGBT rights activist and founder of Bangladesh’s first LGBT magazine, was murdered.